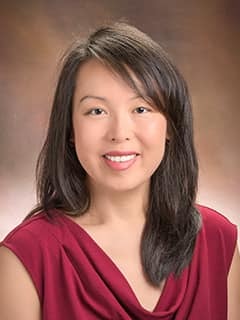 Jie Chen Nguyen, MD, MS, is a pediatric radiologist and Director of the Section of Musculoskeletal Imaging (MSK) with the Department of Radiology at Children's Hospital of Philadelphia. Nguyen JC, Allen H, Liu F, Woo KM, Zhou Z, Kijowski R. Maturation-Related Changes in T2 Relaxation Times of Cartilage and Meniscus of the Pediatric Knee Joint at 3 T. AJR Am J Roentgenol. 2018 Dec;211(6):1369-1375. doi: 10.2214/AJR.18.20026. Epub 2018 Oct 9. Expert Panel on Pediatric Imaging: Safdar NM, Rigsby CK, Iyer RS, Alazraki AL, Anupindi SA, Bardo DME, Brown BP, Chan SS, Chandra T, Dillman JR, Dorfman SR, Garber MD, Lam HFS, Nguyen JC, Siegel A, Widmann RF, Karmazyn B. ACR Appropriateness Criteria® Acutely Limping Child Up to Age 5. J Am Coll Radiol. 2018 Nov;15(11S):S252-S262. doi: 10.1016/j.jacr.2018.09.030. Yi PH, Yi MM, Nguyen JC. Readability of Online Information Related to Pediatric Radiation Safety From Societal Websites. AJR Am J Roentgenol. 2018 Nov;211(5):1128-1134. doi: 10.2214/AJR.17.19299. Epub 2018 Sep 21. Nguyen JC, Allen H, Liu F, Woo KM, Zhou Z, Kijowski R (2018 Oct 9). Maturation-Related Changes in T2 Relaxation Times of Cartilage and Meniscus of the Pediatric Knee Joint at 3 T. American Journal of Roentgenology: 1-7. Doi: 10.2214/AJR.18.20026. PMID: 30299996. Yi PH, Yi MM, Nguyen JC (2018 Sep 21). Readability of Online Information Related to Pediatric Radiation Safety From Societal Websites. AJR Am J Roentgenol., 1-7. doi: 10.2214/AJR.17.19299. PMID: 30240293. Epub ahead of print. Nguyen JC, Yi PH, Woo KM, Rosas HG (2018 Sep 19). Detection of pediatric musculoskeletal pathology using the fluid-sensitive sequence. Pediatr Radiol. doi: 10.1007/s00247-018-4256-z. PMID: 30232532. Epub ahead of print. Nguyen JC, Liu F, Blankenbaker DG, Woo KM, Kijowski R: Juvenile Osteochondritis Dissecans: Cartilage T2 Mapping of Stable Medial Femoral Condyle Lesions. Radiology May 2018 Notes: Epub ahead of print https://doi.org/10.1148/radiol.2018171995. Mitchell J, Bishop A, Feng Y, Farley D, Hetzel S, Ploeg H, Nguyen JC, Noonan KJ: Residual Equinus after the Ponseti Method: An MRI Based - Three Dimensional Analyses. Journal of Pediatric Orthopedics 38(5): e271-e277, May/June 2018. Dillman JR, Rigsby CK, Iyer RS, Alazraki AL, Anupindi SA, Brown BP, Chan SS, Dorfman SR, Falcone RA, Garber MD, Nguyen JC, Peters CA, Safdar NM, Trout AT, Karmazyn BK: ACR Appropriateness Criteria® Hematuria-Child. J Am Coll Radiol. 2018 May;15(5S):S91-S103. doi: 10.1016/j.jacr.2018.03.022. Hattori T, J Chen, AMS Harding, et al. ASIC2a and ASIC3 heteromultimerize to form pH-sensitive channels in mouse cardiac dorsal root ganglia neurons. Circulation Research. July, 2009;105(3):279-286. PMID: 19590043. Mitchell J, JC Nguyen, K Noonan. Is residual equinus after the Ponseti Method related to abnormal ankle morphology in young children? An MRI-based three-dimensional analysis. Pediatric Orthopaedic Society of North America (POSNA) 2017. Submitted abstract. Allen H, Kijowski R, Liu F, Nguyen JC: T2 Mapping of Articular Cartilage of the Normal Pediatric Knee at 3.0T. Society for Skeletal Radiology Annual Meeting, Austin, Texas March 2018 Notes: Oral Presentation. Zhang T, Price C, McCarthy J, Nguyen JC, Hetzel S, Noonan K: The Use of ProDense for the Treatment of UBC/ABC: Experience at Two Institutions. Pediatric Orthopedic Society of North America (POSNA) Annual Meeting, Barcelona, Spain May 2017 Notes: Oral presentation. Mitchell J, Nguyen JC, Noonan K: Is Residual Equinus after the Ponseti Method Related to Abnormal Ankle Morphology in Young Children? An MRI-Based Three-Dimensional Analysis. Pediatric Orthopedic Society of North America (POSNA) Annual Meeting, Barcelona, Spain May 2017 Notes: Poster Presentation. Allen H, Nguyen JC: Nuts and Bolts of Pediatric Orthopedic Hardware. Society of Pediatric Radiology (SPR) Annual Meeting, Vancouver, British Columbia, Canada May 2017 Notes: Poster presentation. Yi P, Nguyen JC: Readability of Online Patient Education Materials Related to Pediatric Radiation Safety. American Roentgen Ray Society (ARRS) Annual Meeting, New Orleans, Louisiana April 2017 Notes: Poster presentation. Allen H, Nguyen JC: Fun with the Physis: A review of Growth Patterns, Important Pathology, and How it Changes Management. American Roentgen Ray Society (ARRS) Annual Meeting, New Orleans, Louisiana April 2017 Notes: Poster presentation. Zhang T, Nguyen J, Noonan K: The Use of Tri-Phasic Bone Graft for the Treatment of Pediatric Bone Cysts: Experience at Two Institutions. American Academy of Orthopedic Surgeons Meeting, San Diego, California March 2017 Notes: Oral presentation. Kinner S, R Kijowski, and JC Nguyen. MRI findings in non-traumatic causes of pediatric knee pain. Radiological Society of North America (RSNA) 2016, Chicago, IL. Scientific Oral Presentation. Farmakis S, L Linscott, A Khwaja, K Caudill, JC Nguyen, and T Tao. Monday Case of the Day: Pediatric. Radiological Society of North America (RSNA) 2016, Chicago, IL. Linscott L, A Khwaja, K Caudill, JC Nguyen, S Farmakis, and T Tao. Tuesday Case of the Day: Pediatric. Radiological Society of North America (RSNA) 2016, Chicago, IL. Khwaja A, K Caudill, JC Nguyen, S Farmakis, L Linscott, and T Tao. Wednesday Case of the Day: Pediatric. Radiological Society of North America (RSNA) 2016, Chicago, IL. Caudill K, JC Nguyen, S Farmakis, L Linscott, A Khwaja, and T Tao. Thursday Case of the Day: Pediatric. Radiological Society of North America (RSNA) 2016, Chicago, IL. Nguyen JC, KG Gill, AC Merrow, KB Markhardt, T Tao, and KW Davis. Imaging of physeal and peri-physeal disturbances. Radiological Society of North America (RSNA) 2016, Chicago, IL. Certificate of Merit Award. Nguyen JC. "Sonography of Inflammatory/Infectious Arthropathies", Pediatric Series: Musculoskeletal Imaging, Radiological Society of North America (RSNA) Annual Meeting, Chicago, Illinois. Nov 2017. Nguyen JC. "T2-Weighted MR Imaging in Children with Musculoskeletal Concerns: Can it be used to Select Patients who can Benefit from a Full Contrast-Enhanced Study", Radiological Society of North America Annual Meeting, Chicago, Illinois. Nov. 2017. Nguyen JC. Guest speaker on pediatric MSK ultrasound. Southwest Ultrasound Society. Mar 13, 2017. Nguyen JC, L Fang, R Kijowski. Quantitative T2 mapping of cartilage overlying juvenile osteochondritis dissecans (JOCD). Society of Skeletal Radiology (SSR) 2017, Santa Barba, CA. Scientific Oral Presentation. Nguyen JC. Pediatric Radiology. Senior resident board review. University of Wisconsin, Nov 2016. Nguyen JC. Round Table speaker. Air in the wrong places. Audience of clinicians, nurse practitioners, and trainees. Sauk Prairie, WI. Nov 1, 2016. Nguyen JC. Pediatric Bone Marrow: Normal and Abnormal. Australian and New Zealand Society of Pediatric Radiology (ANZSPR) 2016. One of four invited international speakers. Gold Coast, Austria. Nguyen JC. MRI diagnosis and classification of meniscal tears. Australian and New Zealand Society of Pediatric Radiology (ANZSPR) 2016. One of four invited international speakers. Gold Coast, Austria.